Since 1952, the young people of Llangollen have presented a Message of Peace and Goodwill from the stage of the Eisteddfod. This grew from a desire to be linked closely with the annual transmission worldwide of such a message by Urdd Gobaith Cymru – The Welsh League of Youth. That message was inaugurated by the Rev. Gwilym Davies in 1922 and had developed from his lifelong work for co-operation between nations. His aims echo the aims of the Eisteddfod and it has been of continuing importance to be able thus to have a ceremony dedicated to an expression of peace and goodwill. Until recently the message – different each year but always with the same theme – was given individually by schoolchildren of the town but in recent a new policy of involving a whole school and indeed, groups of schools has proved effective and rewarding for both the participants the audience. All who have presented and heard the message cannot fail to have been affected by the ceremony where we turn to our young people for an assurance that the values of the Eisteddfod will remain. “Pigtailed Angels” is how DyIan Thomas described the Children’s Choir from Obernkirchen in Germany when they won the Children’s Choirs Competition in 1953. As its ‘own choice’ item they sang a then unknown German folk song which later became known and popular the world over as ‘The Happy Wanderer’. Fame enabled them to make international tours singing in concerts to raise funds for an orphanage in Germany. 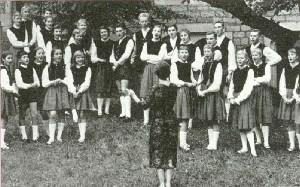 The Obernkirchen Children’s Choir under their Conductor Edith Môller returned to Llangollen in 1960 the principal attraction of the Sunday Evening Concert. Harpist in Heaven – Ffanses Môn M.B.E. “I had played the opening song for some twenty years when one year I asked W.S. Gwynn Williams “Wouldn’t you like to have somebody different.” His answer, “But Ffranses, I haven’t got the cheek to ask anybody else to play to empty seats”. It was true, the marquee was always empty when I played. The Eisteddfod had to open in the morning at nine prompt with a prayer and my penillion solo. At that early hour, the audience hadn’t quite arrived and the choirs were all backstage waiting to come on. But there were always my friends of the Floral Committee and the Music Staff – in a line on the front row, they never let me down! Ffanses Môn played the harp at the official opening in the first 1947 Eisteddfod, competed in the first vocal solo competition, helped secretarially and has generally been involved with the Eisteddfod for the full fifty years.